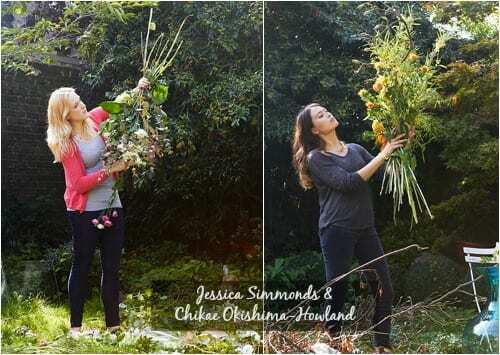 It’s Florist Friday and today I’m thrilled to feature an interview with Jessica Simmonds & Chikae Okishima-Howland of London-based, Okishima & Simmonds. 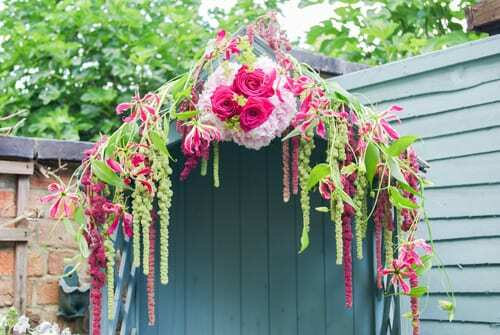 Could you tell us what prompted you both to become florists? Jessie: I’ve been a florist for over 9 years, since I was 15. I blindly applied for a job at a Waitrose and they offered me a part-time job in the floristry department. I’d never even considered working with flowers before, but I’ve always been creative. The girls trained me up so well, and I enjoyed it so much, that I completely fell in love with floristry. The flower bug most certainly caught me and I became obsessed with floral art, gardening, botanical history and wearable fashion floristry. I was working as a florist throughout my Fine Art degree in Leeds, and while being a conventional artist didn’t pan out being the career for me, it’s where I met Chikae and where my passion for all things floral rubbed off on her! Chikae: Having done my degree in Fine Art and various creative courses, I was still waiting to find my calling in life. I knew I had a natural creative flair, a unique style and an eye for colour. But when I enrolled in the summer course at the Covent Garden Academy of Flowers, I had no idea how much I would love floristry. When the two week course finished, I couldn’t imagine not working with flowers again. I had caught the bug like Jessie and had to keep it up. I immediately decided to enrol in the Diploma course and have never looked back. We live and breathe flowers and wouldn’t have it any other way. Our business is still relatively young. We officially started trading in the summer, but it has been a long time coming! We’re currently based in a studio in Fulham, but are hoping to get a larger workspace, where we can run courses around the South West area of London within the next year, and ideally a shop within the next two years. As we don’t have a shop, we focus mainly on large scale events such as weddings, dinners and corporate events. 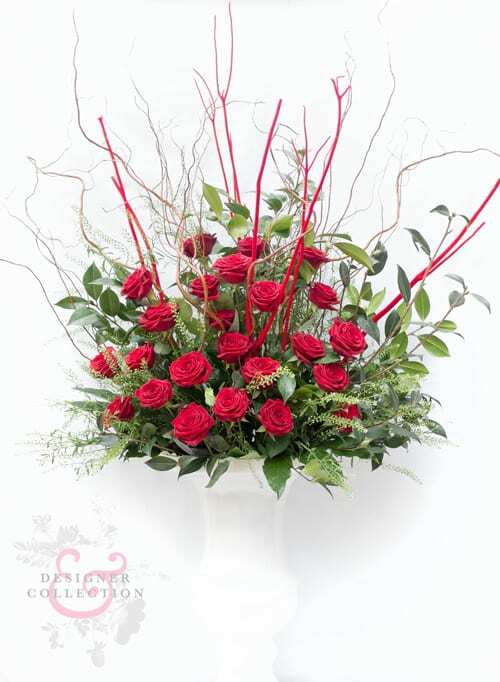 We also do large flower arrangements for offices, restaurants, hotels and other corporate clients on a regular basis. 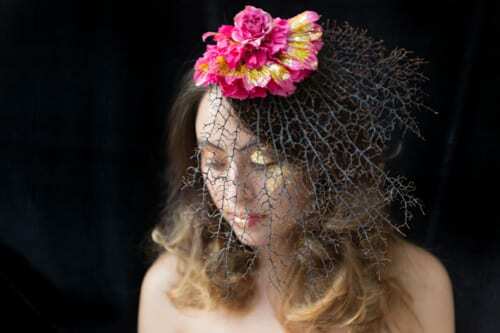 We specialise in Floral Creative Styling, where we work with photographers, make-up artists and set designers to create wearable floral accessories, such as headdresses. We’ve worked with some great photographers and one shoot with the fabulous Stella Morais got picked up by Vogue Italia. 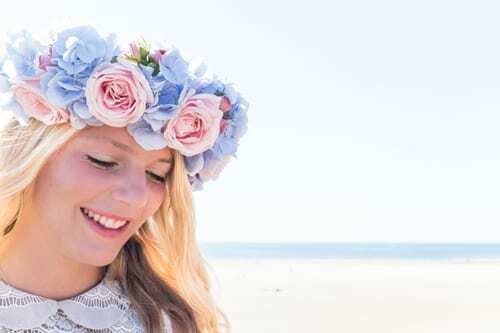 Our floral crowns and head pieces are also hugely popular with brides looking for something a bit different for their big day. And we’ve seen lots of bridesmaids choosing a headdress, instead of a bouquet. Having both studied art, we both have a very creative eye, so draw inspiration from everyday life and the nature and colours that are around us every day. Whether it’s an interesting shaped vegetable at the supermarket or an amazing sunset, everything around us sparks another idea for a floral design. Our first starting point and inspiration is always colour, and we often work with mood boards and colour swabs. Coloured vases and unique accessories are always a good starting point for us too. We’re always collecting interesting pieces that we know we could enhance with flowers. You also can’t help but be inspired when you go round New Covent Garden Flower Market in the mornings. We spend so long there bouncing ideas off each other. It’s a wonder we get anything else done! Also, when in doubt, we can spend hours on Pinterest, drawing inspiration from amazing florists all around the world. Our style is wild, colourful and unique. We’re not constrained by traditional floristry rules and old-fashioned ideas about floral design. We go with our instincts and almost see flowers as an artist’s tool with which you can create something amazing. In a big city such as London, there is minimal interaction with nature and wildlife, so we often use as much natural material as possible, using lots of twigs and lush interesting greenery. We also don’t believe in the word ‘clashing’, so throw all the rules out when it comes to which colours go together…our favourite combination is red and pink! Could you tell us about your Valentine’s Day collection? This is our first Valentine’s Day, and while we wanted to stick with traditional bouquets with gorgeous roses, we also wanted to offer something a bit different. 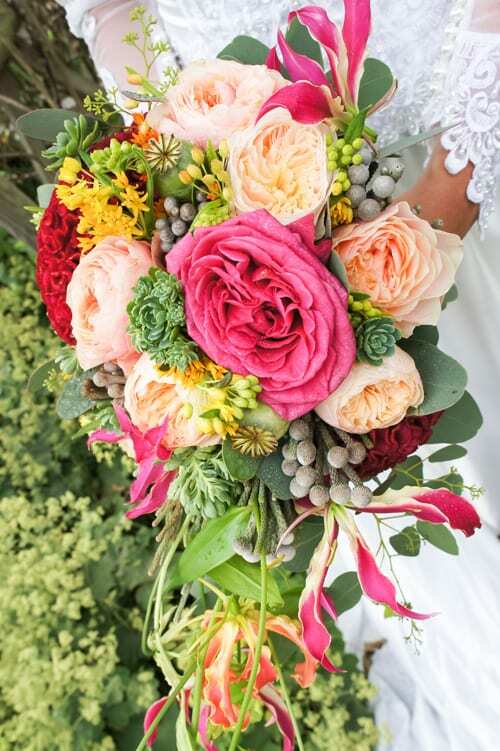 We have a standard collection of stunning bouquets that are full of beautiful blooms…starting from a traditional red bouquet full of roses, through the pink shades, and then ending in a multi-coloured mix that screams Okishima & Simmonds. 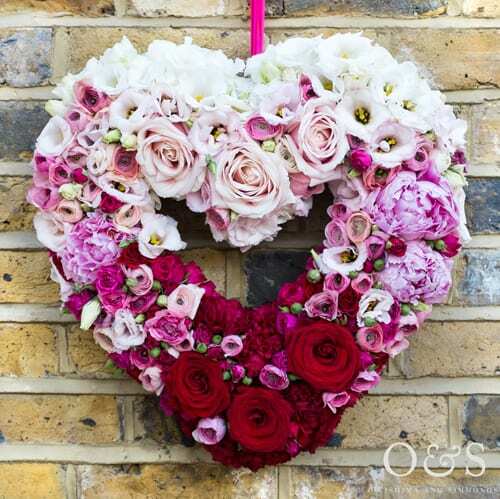 We also have our Designer Collection which includes a floral heart door decoration in ombre shades. 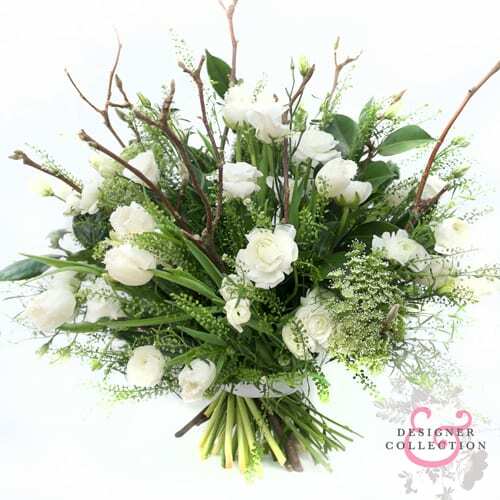 It is absolutely stunning and a fabulous alternative to a traditional bouquet. All items in our Designer Collection come with free cupcakes or brownies by the fantastic Bea’s of Bloomsbury. For those who want to really push the boat out and show their Valentine that they love them every day, we have our Year of Flowers. These packages range from a weekly delivery on the day of your choice, to 4 times a year on special occasions, and means your Valentine will have fresh flowers delivered all year long. Jessie: Like most florists my favourite flower changes on a seasonal basis! In the spring, I love Ranunculus. I think they’re fascinating little flowers and love to watch them open. We even have a simple Ranunculus bouquet in our Valentine’s Collection that’s named after me, because I love them so much! I also love the vibrancy, fragility and delicate nature of Gloriosa. So we often use it in our designs too. And although they open ridiculously quickly, I’m also always amazed by Coral Sunset Peonies. In the summer, they open so flat they look like garden roses. Chikae: I’ve always loved anything small and intricate (especially anything miniature!) So tiny, delicate blooms always appeal to me. Lilac, snowdrops and blossom are always firm favourites of mine, especially as you can see them everywhere in the English countryside over the spring and summer. I love bright neon colours too. So I love the dainty orange Asclepia (Gay Butterfly) which goes from green when it’s in bud to orange, then yellow as it’s blooming. 2014 is going to be a big year for us. We’re planning on expanding our range of products and businesses that we work with. 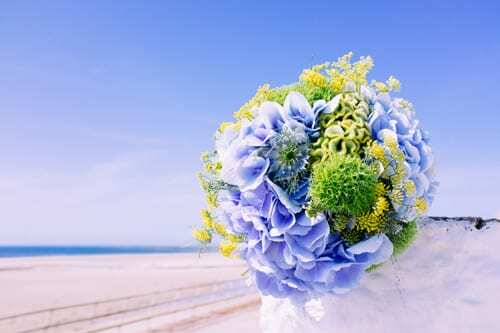 We want to really make an impact on the wedding scene and are planning collaborations with some brilliant companies and individuals to offer full packages to brides. We’re hoping to run some floristry courses once we have a larger space to work from, as we’ve had so much interest. We’ll be offering basic courses for complete beginners up to advance courses in wiring and floral art design, which are planned to start in the summer. We ran a very successful wreath-making workshop over Christmas. So next year, we’ll be running lots of similar ones, including tablecentres and garlands, all through November and December. We’re also excited for the RHS Chelsea Flower Show this year, where we’re going to work with the fabulous Chelsea based clothes designer Charlotte Taylor to create something beautiful for outside their shop by Sloane Square.